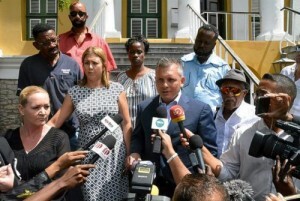 WILLEMSTAD - The Court of First Instance of Curaçao today decided in the confiscation case of a former Prime Minister of Curaçao that he had illegally obtained more than 1.8 million guilders and that this should be deprived of him. In the confiscation case of his partner, the claim for deprivation has been rejected. The confiscation case followed the ruling of the Court in the criminal cases brought against the former Prime Minister and his partner. The former prime minister was convicted, among other things, for official bribery, co-perpetration of forgery and co-perpetrating of money laundering. His partner was also convicted for the same complicity of money laundering. The Court of First Instance examined whether they obtained an unlawful advantage from those offences or from other offences for which there are sufficient indications that they have committed them. The Court found that the offences were committed at the time when the current Criminal Code did not yet exist. Therefore, the old legal provisions from the Penal Code of the Netherlands Antilles must be applied. In that old code, it had not yet been arranged that a joint payment obligation could be imposed. According to the Court of First Instance, there is a joint advantage, but that advantage derives directly from the bribery offence committed by the former Prime Minister. That is why those funds are taken away from him and not his partner. A total of NAf 1,844,190.36 is confiscated from the former prime minister. Part of it is the advantage that he has enjoyed from the bribery offence for which he was convicted. The other part comes from similar facts to those for which he was convicted. According to the Court of First Instance, there are sufficient indications that he has once again been guilty of official bribery and/or money laundering. The Court of First Instance did not consider the statement made by the former Prime Minister in this case plausible.